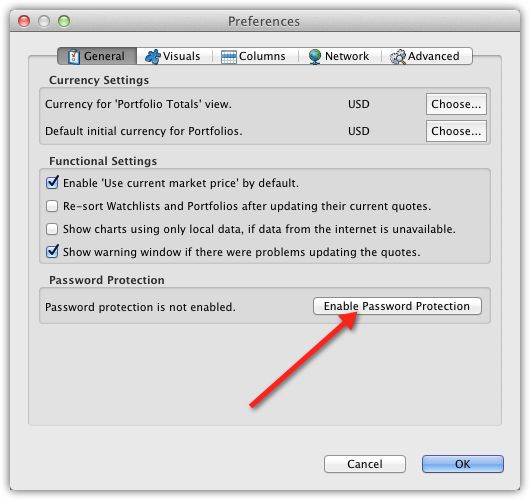 Password required before StockMarketEye opens - After enabling password protection in StockMarketEye, you will be required to enter the password before StockMarketEye will open. Your StockMarketEye data is encrypted - After enabling password protection, your StockMarketEye data files will be encrypted. This means that even if someone has access to the data files themselves, they can not be read (unless they also have the password). The data files are encrypted with industry standard, AES 128 bit encryption. Once you have enabled password protection, do not lose or forget your password. It is not possible to recover the data without the password!! Losing the password also means losing your StockMarketEye data. Without the password, it is impossible to access your data. If this happens, you will have to start from scratch and re-enter the data. To enable password protection, open the Preferences window and go to the “General” tab. Then click on the “Enable Password Protection” button. This will open the “Enable Password Protection” window as seen below. Enter and confirm the password you would like to use. The password must be between 6 and 48 characters long and can not contain any spaces, tabs or other white space. You can also enter a hint to help you remember in case you lose or forget the password. Do not make this too obvious! It should be a hint that only you will understand. 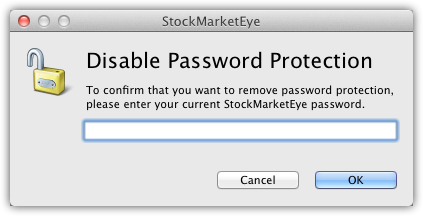 After you click OK, StockMarketEye must be restarted to finish enabling password protection. Now, when StockMarketEye starts, you will first be required to enter your password. In case you need a hint, click the “Get Hint” button to show the hint you entered when enabling the password. 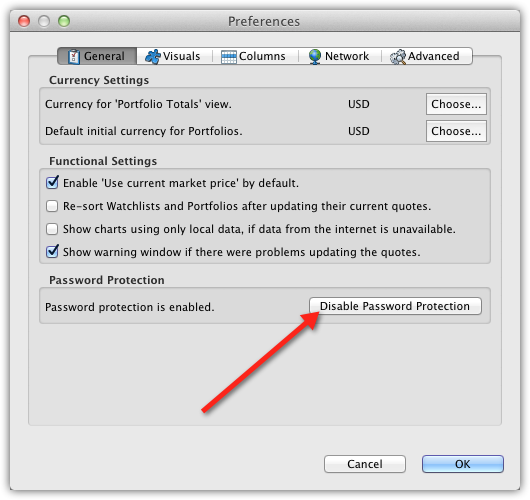 You can disable password protection at any time through the Preferences window. Go to the “General” tab and click on the “Disable Password Protection” button. This will open the “Disable Password Protection” window where you enter your current password. 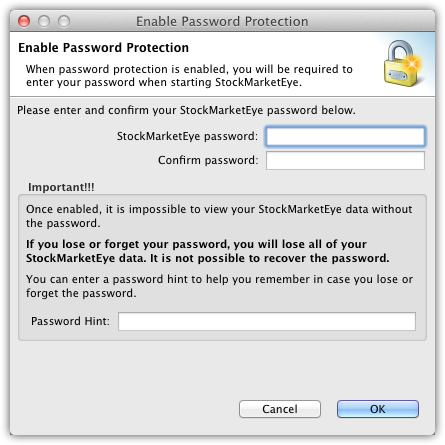 After entering the password, you will have to restart StockMarketEye in order to completely disable password protection. When starting up StockMarketEye no longer requires you to enter the password.